Well I guess in the inevitable has happened and we’ve finally seen some true Highlands’ weather! Our friends Brian and Jayne travelled up from Kent to meet up with us in Malaig, and we all set off the following morning, to head back out to the small isles. While en-route, a quick re-check of the forecast showed that it had changed significantly and that a low pressure system was now headed our way, bringing with it gale force winds and rain. 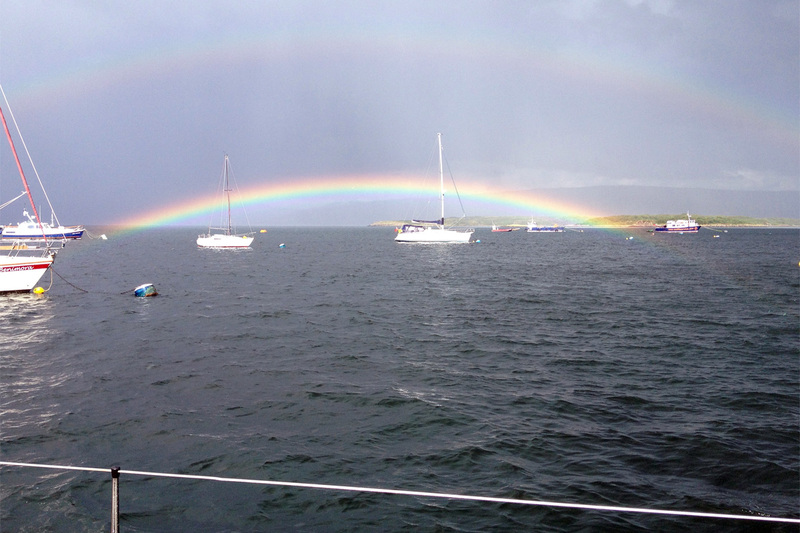 The anchorage we were headed to would have been too exposed so we changed course and headed south to picturesque Tobermory on Mull where we knew we could spend some time ashore. We ended up spending three days there, giving us plenty of time to visit all the attractions and to try (two bottles of) the local distillery’s whiskey. The video above was shot using my phone after we’d reduced both sails to the size of handkerchiefs, and started to head across the bottom of Loch Linnhe to Oban. This area was more exposed to the wind and swell coming in from the Atlantic and we had a consistent F7 for most of the way. The waves look quite harmless in this video but just after we stopped filming one caught the side of the boat and crashed over into the cockpit drenching me. 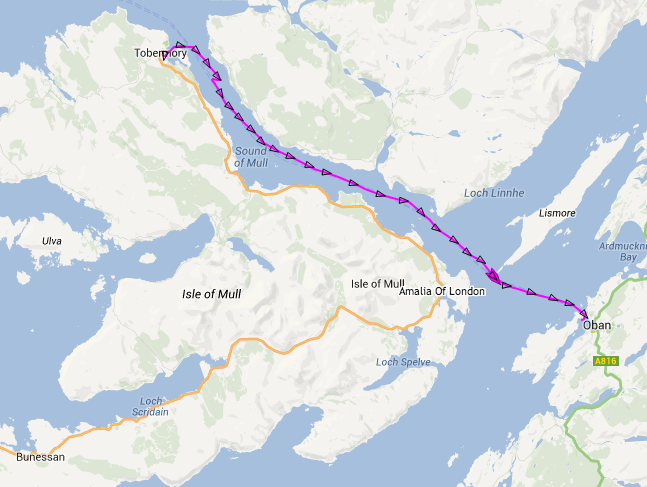 Rather than dropping as we reached Oban, the wind peaked to a F9 reaching 45 knots across the decks. Finally, just to add a little more spice to the mix, the local ferry started to follow us in but after a short VHF conversation with Brian, he very graciously agreed to slow down and give us time to get in well ahead of him. Thankfully both Brian and Jane are very experienced sailors, and they’ve taken this week comfortably in their stride. They are great people and it’s been a pleasure having them on board and listening to their sailing stories from the years of living aboard their boat in the Caribbean.